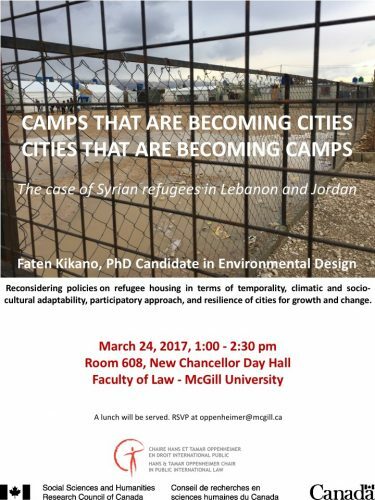 The Oppenheimer Chair is pleased to welcome Faten Kikano, PhD Candidate in Environmental Design, from the Université de Montréal for a conference and a photo exhibition. Ms. Kikano will present her research and her photos about the life of Syrian refugees in camps in Lebanon and Jordan. Join us for a lunch, a short conference and a commented tour of Ms. Kikano’s photos which will be exposed in the Atrium of the Faculty of Law. 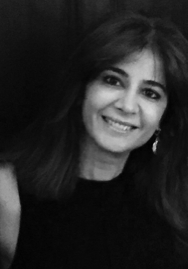 Faten Kikano is a Ph.D. candidate affiliated to the IF Research Group at the School of Architecture of Université de Montréal. From 1995 till 2014, she worked as a practitioner in architecture and design projects. Simultaneously, she held a teaching position at the Lebanese American University (LAU), the American University of science and Technology (AUST), and the Académie Libanaise des Beaux-Arts (ALBA) in Lebanon. Her research is about exploring the process of space appropriation in different forms of housing for refugees. Her study focuses on the case of Syrian refugees in Lebanon. She has received the prestigious scholarship Joseph-Armand Bombardier from the Social Science and Humanity Research council (SSHRC), and the doctoral scholarship from Fonds de recherche du Québec – Société et culture (FQRSC). She has lately participated in many international conferences related to refugee studies, urban development and migrations, and post-conflict reconstruction. She was also involved in various humanitarian activities in refugee camps.